The dry ripe seed of deciduous shrub or small arbor Ziziphus jujube Mill. Var. spinosa (Bunge) Hu ex H. F. Chou of family Rhamnaceae. Hebei, Liaoning and Henan provinces and so on in China. Collected in the end of autumn when seeds are ripe. 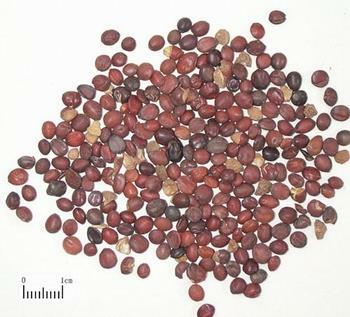 Large and full shape, purple red and intact seed coat, yellowish white kernel, without damaged by vermin and without hull. Removed flesh and fruit-stone, dried in the sun; unprocessed or stir-baked. Sweet, sour, neutral; heart, liver and gallbladder meridians entered. Tonify heart and nourish liver, induce tranquilization, check sweating. It has actions of tonifying yin and blood of heart and liver, also inducing tranquilization, so it is the key herb for nourishing heart and tranquilization. For palpitation, fearful throbbing, insomnia, amnesia, etc. due to yin-blood deficiency and heart-mind loss of nourishment, it is often combined with yin-blood tonifying herbs. Such as Dang Gui, Shu Di Huang, He Shou Wu and so on. For Lassitude, anorexia, palpitation, insomnia, amnesia, dream-disturbed sleep due to insufficiency of both heart and spleen, it is combined with Ren Shen, Huang Qi and Dang Gui, etc. to tonify both qi and blood in Gui Pi Tang from Ji Sheng Fang. For restlessness due to deficiency, insomnia and irritable dizziness due to deficiency of liver blood and inside disturbing of deficiency fire, it is often combined with herbs to nourish blood, induce tranquilization, clear heat and relieve restlessness. For instance, it is combined with Zhi Mu, Mai Dong and Shu Di, etc. For palpitation, fearful throbbing, restlessness due to deficiency, insomnia, amnesia, seminal emission due to yin deficiency of heart and kidney with yang hyperactivity, it is often combined with yin-nourishing and blood-tonifying herbs and yang-subduing and tranquilizing herbs. For instance, it is combined with Sheng Di, Mai Dong, Zhen Zhu Mu and Long Gu, etc. It can check sweating so it can be indicated for spontaneous sweating due to deficiency and night sweat. For spontaneous sweating due to qi deficiency, it is often combined with herbs to nourish qi, strengthen superficies and check sweating. For instance, it is combined with Wu Wei Zi and Huang Qi, etc. For night sweat due to yin deficiency, it is often combined with herbs to nourish yin and check sweating. For instance, it is combined with Shan Zhu Yu, Di Gu Pi and Zhi Mu, etc. Decoct 9~15 g. Take powder l.5~3 g.